A Charlie Brown Christmas was an instant hit when it was first broadcast in 1965 and has become a classic, mostly, I believe, because of Charles Schultz’s simple point: Christmas is about Jesus. Millions of us make watching that program part of our annual holiday ritual because we like to be reminded that Christmas is supposed to be more than shopping, bustle and stress. We agree (at least to some degree) that “Jesus is the reason for the season” and accept (at least nominally) that we should “Keep Christ in Christmas.” Charlie Brown helps us keep that perspective. But what do these popular sayings mean exactly? Is there more to them than some mild anti-consumerism? That is what this post is about. I think most of us approach Christmas in basically the same way we do Presidents’ Day or Dr. Martin Luther King Jr. Day. These days are about celebrating the lives of great men, particularly everything that happened after they were born. We remember their heroic works, wise teaching and outstanding character. Certainly this is appropriate, and just as we should take time to think about presidents and civil rights leaders on their holidays, at Christmas we should focus on all that Jesus was, taught and did during his life. However, I believe that when it comes to Christmas, we would do well to also examine the significance of what happened on Jesus actual birth day. Although many great things occurred after Jesus was born, the nativity itself was an amazing event. Something objective (and wonderful) happened that night in Bethlehem, and I think to fully understand Linus’ answer we need to explore just what that was. We will do that primarily by discussing the story behind the Christmas story. Jesus was a Jew, and claimed to be the Jewish Messiah, or Savior. In order to understand Jesus, then, we must have some understanding of the Jewish Scriptures (what Christians now call the Old Testament) and the Jewish culture into which Jesus was born. When we view the Christmas story in that light, a whole new dimension of meaning is illuminated. Along the way, I will point out the places where we fit into the story. The Old Testament is very symbolic, and is meant to teach us not just about the Jews, but also ourselves. As we see how Jesus fulfilled some of the Old Testament imagery, we will see what he did (and is doing) for us. This quick journey is broken into three sections. To provide some context, I will start by briefly reviewing the story of the Children of Israel, paying special attention to their exile to and escape from Egypt. We will discuss what this story tells us about the world and ourselves. I will then talk about the Festival of Tabernacles and make the case that Jesus was actually born on the first day of this festival. Part three is about the significance of this date. 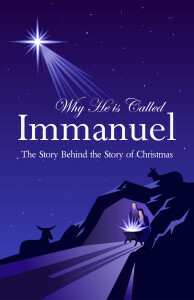 We will explore what Jesus birth date tells us about the meaning of his birth. My hope is that by the end of this article you will be able to better see how relevant the timing of Jesus’ birth is to us today. According to the Bible, humans were created to live with God. Adam and Eve were put in the Garden of Eden so they could do just that (Genesis 2). Humans were made for relationship with their creator. However, Adam and Eve rebelled against God and that relationship was broken. The first couple was expelled from their natural home and exiled from God because of their disobedience (Genesis 3). They found themselves living on a planet gone awry. So do we. We are all meant to live with God, but are each born separated from him. We belong with God in Heaven, but are stuck without him here on earth. This is one reason why we are never fully content with our lives. No matter what we do or how much stuff we have, we are not living the life we were meant to live. We are supposed to live with God. Until that separation is fixed, we will never be satisfied. The Bible gives us a clear allegorical picture of our situation in the story of the Israelites in Egypt. That famous chronicle starts with God promising Abraham that his descendents would be a great nation and be placed in a country of their own, the land of Canaan (Genesis 12:2-7). There God would live in close relationship with his people. The family of Abraham became known as the Israelites and they represent the people of the earth, created to live with God. Unfortunately, just like the descendents of Adam and Eve, the children of Abraham were separated from their home and their creator. Because of famine, the entire family was forced to move to Egypt (Genesis 41-47). For the next 400 years, the Israelites lived in a land that was not their home. So do we. Just as the Israelites were aliens and strangers on foreign soil, longing for the country they were meant to live in, we are aliens and strangers on this fallen planet, longing for our true home, Heaven. We will not be satisfied until we get there. Of course, that is not the full story. After all, if the only problem the Israelites faced was being away from home, they simply could have packed up and moved. They couldn’t do that because of two other problems they had: they were under God’s judgment for turning away from him and worshiping the gods of Egypt and they had become slaves. Over the years, the Israelites fell into idolatry. They rejected the God of Abraham and followed the gods of Egypt. The penalty for this sin was death. Also, as the number of Israelites grew, the kings of Egypt forced them into slavery to keep them from becoming a threat (Exodus 1:8-11). The Israelites couldn’t leave because they didn’t have the power to overthrow the oppressive ruler. They needed help. The Bible tells us that this is the human predicament as well. We have the same three problems as the Israelites. We are separated from out true home, sinners deserving death and slaves of Satan. When Adam and Eve rebelled, they put themselves under God’s judgment and the devil took control. Satan is called the prince of this world (John 12:31, 14:30, 16:11), the god of this age (2 Corinthians 4:4), the ruler of the kingdom of the air (Ephesians 2:2), and the ruler of darkness (Ephesians 6:12). During the temptation of Christ in the desert, Satan showed Jesus “all the kingdoms of the world” and said to him, “I will give you all their authority and splendor, for it has been given to me, and I can give it to anyone I want to” (Luke 4:6). Scripture is clear that Satan has authority over this planet. It is also clear that we are sinners who are slaves in his evil kingdom. The Apostle Paul writes that everyone is “sold as a slave to sin” (Romans 7:14), a sentiment echoed by Jesus in John 8:34: “I tell you the truth, everyone who sins is a slave to sin.” Paul also argues that “when you offer yourselves to someone you obey him as slaves, you are slaves to the one whom you obey – whether you are slaves to sin, which leads to death, or to obedience, which leads to righteousness (Romans 6:16). In a letter to Timothy, Paul tells his apprentice that the ungodly must be instructed “in the hope that that God will grant them repentance leading them to a knowledge of the truth, and that they will come to their senses and escape from the trap of the devil, who has taken them captive to do his will” (2 Timothy 2:25b-26). So the allegorical picture of our situation looks like this: We are the Israelites, Egypt is Earth, the Egyptian ruler, Pharaoh, is Satan and the Promised Land, Canaan, is Heaven. Just like the Israelites, we live as slaves in a foreign land; and just like the Israelites, we don’t seem to have the power or ability to find our way home. The Israelites called out to God and asked Him to rescue them from their suffering (Exodus 2:23). In response, he enacted the great drama of redemption that we now know as the story of the Exodus. The historical account of the Israelites is not just an allegory in describing living in slavery to a foreign tyrant. It also describes salvation from that situation. The extraordinary tale of the Israelites’ escape from slavery and journey to the Promised Land is a metaphorical road map of the path to Heaven. The story of their redemption is meant to instruct us about what is necessary for our redemption. By learning how the Israelites arrived (or failed to arrive) at their home, we can learn how to reach ours. Here is a brief summarize of that journey. God sent Moses to lead the chosen people out of Egypt and then sent ten plagues to show his authority to accomplish this (Exodus 7:1-12:30). Each plague was a piece of support for Moses’ claim that the God of Israel was ruler of all the gods of Egypt. They were also acts of judgment on the people and their gods. In the final plague God killed the firstborn of every family except those that sacrificed a lamb and put its blood over the door of their house. The angel of death passed over these homes and left the families unharmed (Exodus 12:1-30). After this plague, the Israelites were allowed to leave Egypt and they started across the wilderness to the Promised Land (Exodus 12:31-42). The ten plagues took care of two of the Israelites’ problems. The power of the Pharaoh was defeated which set the people free from slavery. Also, the penalty for sin was paid by the Passover lamb. The people were no longer under God’s judgment. That journey across the desert is where the importance of the birth date of Christ comes in. The Children of Israel didn’t do very well in the wilderness. They whined and complained about food, water and their generally tough circumstances (Exodus 16:2; 17:2). Then they made their biggest mistake by building an idol to worship while waiting for Moses to come back from the top of Mount Sinai (Exodus 32:1-6). God made success on the journey possible by actually coming down and traveling with the Israelites. We will now examine what that looked like and then see how God does the same thing for us. As sojourners in the wilderness, the Israelites obviously did not have any permanent dwellings in which to live. However, they did not leave themselves completely open to the elements. They carried along portable tent-like structures. These booths, or tabernacles, were basically poles covered by flexible material like cloth or animal hides. These shelters provided protection and easy portability. When God decided to come and travel with the Israelites across the wilderness, he ordered them to build for him a portable structure to inhabit: his tabernacle (Exodus 25:8). You can find the explicit architectural instructions for this building in Exodus Chapters 25 through 30 and the account of the building process in Exodus Chapters 35 through 40. When they were finished, a cloud covered the tent “and the glory of the Lord filled the tabernacle” (Exodus 40:34). The book of Exodus then concludes, “In all the travels of the Israelites, whenever the cloud lifted from above the tabernacle, they would set out; but if the cloud did not lift, they did not set out – until the day it lifted. So the cloud of the LORD was over the tabernacle by day, and fire was in the cloud by night, in the sight of all the house of Israel during all their travels” (Exodus 40:36-38). Although there are many levels of meaning to the tabernacle, for our purposes I will focus on the fact that in order to get the people across the wilderness, God came down and dwelt in the same type of portable home as they were living in. He condescended to help the Israelites by leaving his heavenly home to reside with them in their temporary shelters. God’s presence provided the people with guidance and protection. With the cloud and the fire always in view over the tabernacle, they could be assured that they were safe and on the right track. If ever doubts arose about the chances of making it across the wilderness successfully, the people could gain assurance from the knowledge that God was with them. In later years, after the Israelites were settled in the Promised Land, they were commanded to commemorate this aspect of the journey by holding the Festival of Tabernacles, also known as the Feast of Booths or Sukkot in Hebrew. (Deuteronomy 16:13-15). Here are God’s directions for the festival as recorded in Leviticus. To this day certain Jews celebrate the Festival of Tabernacles by building portable huts outside their permanent homes and living in them for a full week. As they celebrate the harvest and God’s continued provision and protection, they remember a time when God provided for them in temporary shelters and protected them when they were sojourners in the wilderness. They recall how God provided manna for them from Heaven and water from the rock, and they especially remember how God journeyed with them across the wilderness by inhabiting his own temporary shelter, his own tabernacle. What does this mean to us? I’ll begin answering that question by arguing that Jesus was born on the first day of the Feast of Tabernacles; then we’ll look at why that date is important. We can start establishing a birth date for Jesus by figuring out when John the Baptist was born. John’s father Zechariah was a priest serving on duty in the temple when the angel Gabriel appeared to him to tell him that he would have a son (Luke 1:8). We know from Luke 1:5 that Zechariah belonged to the priestly division of Abijah. From this bit of information we can nail down almost exactly what time of year the angel appeared him and then deduce from that when Jesus was born. To do so, however, we will need some background in the Jewish priestly system. Priests served in the temple in teams, with each team serving for one week at a time (1 Chronicles 9), two times a year. The teams were scheduled to serve in a certain order each year, and 1Chronicles 24:7-18 explains that the division of Abijah was the 8th team of the year. This was called the eighth course. Along with their two weeks of individual priestly service, all the priests would report to the temple and serve together three times a year during the Feast of Weeks, the Feast of Unleavened Bread and the Feast of Booths (Deuteronomy 16:16). The total number of weeks served in the temple by each priest, then, was five. Because the Feast of Unleavened Bread and the Feast of Weeks both occur within the first eight weeks of the Jewish year, the eighth course would have served during the tenth week of the year (approximately Sivan 12-18). As such, the priestly division of Abijah would have started serving on the second Sabbath of Sivan and worked the following six days. We can surmise that this was the week of Gabriel’s visit to Zechariah. Assuming Zechariah’s wife, Elizabeth, conceived John the Baptist soon after Zechariah had finished his Temple service, she would have become pregnant after the third Sabbath of Sivan (approximately Sivan 19-25). Three months after that, John the Baptist was born, about the time of Passover. This also may be more than coincidence because of the imagery found in the Seder meal. As part of this dinner, Jews place an empty chair at the table for Elijah, hoping that he will soon arrive and fulfill the prophecy of Malachi 4:5 that says that Elijah must return before the Messiah and prepare the way for him. So if our dates are correct, at just the time the Jews were praying for Elijah to return, John the Baptist was born, a man who Jesus said was in fact (at least symbolically) Elijah. Speaking of John, Jesus said, “And if you are willing to accept it, he is the Elijah who was to come” (Matthew 11:14). Jesus was born six months after Passover, then, in autumn, right around the time of the Festival of Tabernacles. To begin to understand why the actual date of Jesus’ birth is important, we need to realize that God often corresponds major historical events to other events in order to help us understand their significance. For instance, Jesus was killed on Passover so that we would better understand that he is the lamb that takes the punishment for sin. We won’t go into detail here, but other events that similarly correspond to Jewish holidays would be Jesus’ resurrection on the Feast of Firstfruits (Leviticus 23-14, 1 Corinthians 15:20-23), and the outpouring of the Holy Spirit at the Feast of Weeks (Leviticus 23:15-22, Acts 2), to name but two. The significance of Jesus being born on the Feast of Tabernacles can be clearly seen when we realize that by descending to earth to take up residence in a human body, Jesus reenacted and fulfilled the act of God descending to earth in the wilderness to take up residence in a tent. Just as the tabernacles were the temporary dwellings of the sojourning Israelites as they traveled to their permanent home, Canaan, our bodies are our temporary dwellings as we travel across the wilderness of life to our permanent home, Heaven. And just as God came down to help the Israelites along in their quest by living with them in the same type of tent as they were using, Jesus came down to help us along by living with us in the same type of tent that we use: a human body. That is why John can say, “The Word became flesh and made his dwelling among us. We have seen his glory, the glory of the One and Only, who came from the Father, full of grace and truth” (John 1:14). The term “made his dwelling” in this verse is literally “tabernacled.” It comes from the Greek word skenos, which means tent or tabernacle and refers to the Hebrew sukkah, the singular form of Sukkot. John is saying that in Jesus, God took up residence on earth in the same way he did in the desert. By becoming flesh, he set up his tabernacle in the midst of all the rest of the tabernacles so that he might get us through the wilderness. As Matthew explained, this was a fulfillment of a prophecy in Isaiah: “All this took place to fulfill what the Lord had said through the prophet: ‘The virgin will be with child and will give birth to a son, and they will call him Immanuel – which means, “God with us”’” (Matthew 1:22-23). By now you might be thinking, “I see how Jesus could play the same role that God played in the desert, but Jesus is no longer with us. He no longer inhabits an earthly body, so what good will that do us today?” That is a fair question, and it leads us to a discussion of the Holy Spirit. When Jesus was preparing to leave this world, he comforted his disciples by assuring them that they would not be left alone. After a brief discussion with Judas, he gave this counselor a name: The Holy Spirit. “All this I have spoken while still with you. But the Counselor, the Holy Spirit, whom the Father will send in my name, will teach you all things and will remind you of everything I have said to you” (John 14:25-26). Jesus was telling the disciples that they need not worry because when the Holy Spirit comes, God will not just be dwelling in a human body, but he will be dwelling in their human body. God will actually take up residence inside of them. They will be the tabernacle, or as Paul describes it, God’s temple: “Don’t you know that you yourselves are God’s temple and that God’s Spirit lives in you?” (1 Corinthians 3:16). Jesus described the duties of the Holy Spirit more fully later in the same discourse. Now we know that if the earthly tent [skenos] we live in is destroyed, we have a building from God, an eternal house in heaven, not built by human hands. Meanwhile we groan, longing to be clothed with our heavenly dwelling, because when we are clothed, we will not be found naked. For while we are in this tent, we groan and are burdened, because we do not wish to be unclothed but to be clothed with our heavenly dwelling, so that what is mortal may be swallowed up by life. This ceremony was about asking God to bless the upcoming rainy season. It was very joyful, anticipatory, and, indeed, Messianic. They were thinking of God’s miraculous provision of salvific water in the desert as they looked ahead to what God would do to save them in the future, not just from physical drought, but from all oppression. In this spirit, they would refer to Isaiah 12, particularly verse 3 (in bold). Just as the people are asking for the Messiah during the biggest day of the Festival of Tabernacles, Jesus stood up and said “Here I am! Are you thirsty for the water that will provide eternal life? I am the source. I will send the Holy Spirit to inhabit you.” It is a wonderful image. In explicitly comparing himself (and the Holy Spirit to follow) to the water provided to the Israelites in the desert, Jesus establishes imagery that was later expounded on by Paul. In talking about the desert wanderers, he explains, “They all ate the same spiritual food and drank the same spiritual drink; for they drank from the spiritual rock that accompanied them, and that rock was Christ” (1 Corinthians 10:3-4). God will get us across the wilderness by dwelling with us. He comes down and takes up residence in our temporary dwellings in order to guide, protect, and strengthen us as we travel. He enables us to live righteously. Our hope for getting safely home rests in the indwelling (tabernacling) of the Holy Spirit in our bodies. The Festival of Tabernacles was the only festival with the explicit command to be joyful. In Bethlehem, to the singing of angels, God indwelt our tabernacle, our body. He dwelt with us and continues to do so today through the Holy Spirit, so that we might make it to the Promised Land. That makes Christmas very merry indeed.